NOTE: The GN Netcom 4800 Wideband operates a true IP bandwidth (150-6800 Hz) and has solid stereo quality. 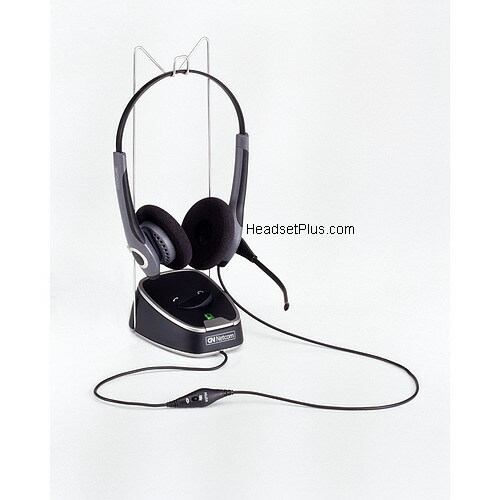 IMPORTANT: The GN Netcom 4800 headset system does not have a quick disconnect feature and is NOT wireless. The headset is connected into the base unit. It is NOT compatible with cordless telephones. In today’s open office environments, unwanted noise can decrease productivity by up to 20%. Not surprisingly, more and more employees are streaming music to block out the sounds of photocopiers, loud colleagues and other annoyances. That means when a call comes in, people take off their headphones and pick up the handset, assuming they hear their telephone ring at all. The GN Netcom 4800 solves all these problems by seamlessly integrating computer applications and telephony as well as providing the freedom of working hands free all the time.